Investigate changes in British life immediately after the war, with photos, facts and a timeline, then explore 20th-century Britain decade by decade. Examine case studies and listen to eyewitness accounts of the car, oil, shipbuilding and carpet industries in Scotland after 1945. Watch film footage about the end of British rule in India, Ghana and Nigeria and see how the British tried to defend their actions in the Suez Canal crisis. Find out how life in Britain has changed since 1948. Try a quiz and find out about supermarket shopping since 1948. Find out how you might have dressed and the food you would have eaten in early 1950s Britain. Explore everyday life in Scotland in the 1960s. Watch a video clip of highlights of the 1966 World Cup when England achieved their historic win. Dress men and women in outfits from the 1950s and 1970s. A short online guide to the history of Northern Ireland. A brief summary of Margaret Thatcher's time in office as the first female Prime Minister of the UK. An online guide to Queen Elizabeth II. Tells the story of how life in Britain changed in the years after the Second World War, from post-war street parties to the celebrations on the eve of the new millennium. Full of intriguing facts, illustrations, photographs, posters, maps and timelines. Includes internet links to websites for further information, including film footage, eyewitness accounts, online games, puzzles and more. 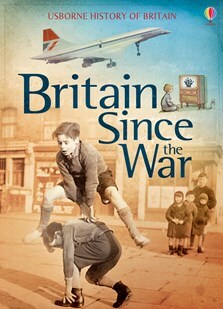 An interesting and readable account with lovely illustrations of everyday life and important events for all KS2/3 pupils, parents and teachers who want to understand what life was like for previous generations and the way that Britain has changed since the war.